Christopher Creighton, M.D. is a pain management physician at Physician Partners of America Pain Relief Group – Richardson, Texas. He brings 25 years of experience to the practice, drawing upon a variety of specialties including anesthesiology, internal medicine and pathology. Dr. Creighton earned his medical degree from the University of Chicago Pritzker School of Medicine. He completed his residency in anesthesiology at Washington University Barnes-Jewish Hospital and internships in surgery, pathology, and internal medicine. 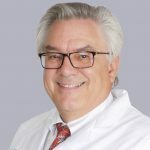 A lecturer and contributor to several medical publications, he has been listed in America’s Top Anesthesiologists, the Global Directory of Who’s Who and Who’s Who in American Medicine, among others. He is certified by the American Board of Anesthesiology in anesthesiology and pain medicine, and is a member of the American Pain Society and the American Society of Regional Anesthesia and Pain Management. He most recently served as president and medical director of Advanced Pain Specialists, Inc. in St. Louis, MO, and as medical director at Des Peres Hospital Department of Pain Management, also in St. Louis. Before that, he was medical director of Comprehensive Pain Management Services Clinic at St. Joseph’s Hospital – Kirkwood, in St. Louis. Earlier in his career, Dr. Creighton served as assistant professor of anesthesiology at West Virginia University School of Medicine as well as co-director of its Center for Pain Management and its pain fellowship program. Before that, he was chairman of the Department of Anesthesiology at Morris Hospital, Morris, Ill.
His approach to interventional pain management is to create an accurate diagnosis first, and have as many tools to address that diagnosis as possible. “My deepest sense of satisfaction comes from improving the quality of life for patients and increasing their functional abilities,” he says. He and his wife of 25 years have a daughter who attends the University of Southern California, and a son pursuing post-graduate studies at Texas A&M University. In his spare time, Dr. Creighton enjoys scuba diving, reading, hiking and cycling. He and his son also recently learned to sail together in San Francisco Bay. Dr C,had a nice easy energy and was easy to talk to and addressed my concerns. If i ever decided i needed therapy and he did private practice he and i could afford him, he would be my choice to continue my journey of mental health and exploration. Dr. Creighton is absolutely great. He was able to nail down my symptoms and knew exactly what my lower back pain problem was caused from just by the way I was sitting. The guy knows his stuff. It shows. I am scheduled for an injection in my back in about a month and he says with 1-2 injections, he's 98 percent sure that will correct my lower back pain and I won't be hurting. If that's the case, this guy will be my hero. Very knowledge about. Doesn't sugar coat or beat around the bush on things. He's short, sweet and to the point. Very good guy and good doctor so far. Keep it up Dr Creighton! I would recommend Dr. Creighton to any person that is suffering from chronic pain. He not only manages the pain he offers alternatives to my condition which is severe osteoarthritis of both knees. Wonderful and highly intelligent specialist! Definitely recommend! Dr. Creighton and staff are very good at their jobs, take a good amount of time with me as a patient and have been able to help me reduce my pain level. Occasionally, the amount of time from appointment scheduled to seeing the doctor runs a little long. However, the care is worth it! The doctor has good people skills, is a good listener and answered all my questions about many different issues. I could not be more pleased with the way Dr. Creighton has treated my peripheral neuropathy. He came highly recommended by Methodist Hospital referral system and he has treated myself with the highest degree of professionalism. I have spook with a number of other patients in the waiting room while waiting for my appointment. They all Love Him. The staff has always treated me with Great respect. I would tell anyone with ongoing pain to have chat with this excellent Pain Dr. I was referred to Dr. Creighton by Methodist Hospital referral service. On the first visit, we spent over 30 minutes discussing my 20-year problem with peripheral neuropathy. Dr. Creighton came up with a treatment plan that took care of my Pain. Not only is he a very experienced physician he has a Great personality to Boot. I highly recommend a visit to Dr. Creighton if you are in pain. The Doctor is excellent, but you first to pass the staff who are the worst!!! Very rude!!! Dr. C was my doctor for a long time. I wrote a previous review about him but had to write another one now that he is gone. Dr. C if you read this, it's Jessica. You know me, lol. Always remember you were the best doctor ever. Whoever is lucky enough to have you as their doctor where your going will see that to. Dr. C was and is one of a kind. Very intelligent and kind. When I saw him he took the time to talk and treated me like a person, not a pay check. It's ashame that we lost a great doctor. You won't be forgotten Dr. Creighton!!! He takes the time to listen to you, and is extremely helpful. Doctor Creighton has given me more quality of life and peace of mind knowing I'm in good hands finally its worth the 100+miles of driving to see him and after 40+surgeries I hope he remains Doc till my ride is thru. Thank you Doctor Creighton (Boss) from Roy C and family. Dr. C is an amazing doctor. He listens to you and truly wants to help you feel better. He always calls me back if I'm having a bad experience with a certain medicine and finds another solution. He's smiley and very sweet on top of that. 2.2 miles, and the clinic will be on your left.